Drs. H. Mursini, M.Sc. Born on December 28, 1958 in Gunung Village, He is known as a senior politician of the Partai Persatuan Pembangunan (PPP) since 1990 until now. Men who have siblings of each Drs. Ali Anwar, Mariana Nayan, Hj. Rosmaini and Miswati, before becoming the number one person in Kuantan Singingi regency, serving long enough as People's Representative in DPRD Riau. Starting from the period 1999-2002 and continued in the period 2004-2009. However, in the second period of serving in the DPRD Riau, in 2006 he released his position in legeslatif and served as Vice Regent of Kuantan Singingi period 2006-2011. A number of important positions in the DPRD Riau ever mandated to himself. Among them as Secretary of People's Welfare Commission DPRD Riau (1999-2002), Chairman of Development Commission DPRD Riau (2004-2006). After full duty as Vice Regent of Kuantan Singingi Regency for the Period 2006-2011, In 2014 he re-entered as People's Representative in Riau Province DPRD period (2014-2019). In 2016 he decided to participated in being nominated as Regent of Kuantan Singingi Regency and was elected as Regent of Kuantan Singingi Regency period 2016-2021. Not only institutionalized by the people and government, Husband of Hj. Emi Safitri is also known as a person who do a lot of activity in a number of organizations. A number of organizations entrusted to him include Vice Chairman of PPP Riau (1998), Secretary of PARMUSI Riau (2003-present), Chairman of KOMINDA Kuantan Singingi (2007-2012), Chairman of ICMI Kuantan Singingi (2007-2012), Chairman of Kuantan Singingi Art Council (2008-2013), Chairman of the Kuantan Singingi Narcotics Agency (2007-2012), Chairman of LPTQ, Secretary of Riau Tapak Suci and other organizations at the Provincial and Regency level. Drs. 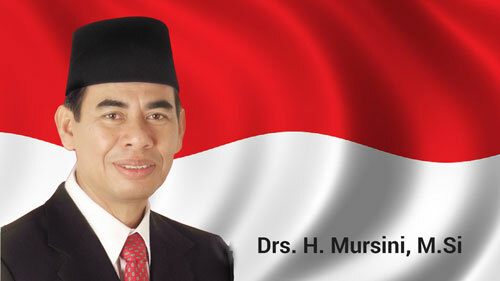 H. Mursini, M.Si graduated from elementary school in 1972 at Gunung Toar, State Technical School (ST) Teluk Kuantan in 1976, State Technical College (STMN) Pekanbaru in 1978. Graduated from STMN Pekanbaru continued his study at FISIP UNRI Pekanbaru and earned his Bachelor of Sociology Bachelor Degree in 1984. He then continued his undergraduate education at FISIP UNRI and successfully graduated in 1987. And continued with the same Master Program (post graduate) at the Postgraduate Studies Program of FISIP UNRI, with M .Si degree in 2008.